The Varnished Culture has been a fan of Agatha Christie novels for yonks – she’s really terrific – but surprisingly for her very theatrical books, they don’t tend to translate to the screen too well. Whether Poirot is played by Peter Ustinov, David Suchet or Albert Finney, he doesn’t seem to be just right. And his supporting casts, possibly from snobbishness, act like a bunch of rejects from a provincial repertory company. The scenery-chewing is entirely superfluous in filming a Christie – certainly she deployed ‘types’ as characters, so why slice the ham so thick on top of that? It isn’t required, or helpful. Murder on the Orient Express is one of the Dame’s best-known books, beloved of Freud and a guilty pleasure for even those readers who could afford a ticket on that famous caboose. Yes, people claim, with some justification, that she cheated like mad, but who cares? Christie was inspired by the Lindbergh kidnapping case and she had been previously stuck on the Simplon-Orient during bad weather. Furthermore, despite the outward appearance in the book, of a strange public crime in sumptuous surroundings, the plot, as it happens, answers closely to Poirot’s own recipe for a perfect murder story, “A very simple crime. A crime with no complications. A crime of quiet domestic life…very unimpassioned – very intime.” [The ABC Murders]. It’s an enthralling ride where the improbable does not fail to convince. Would that one could say the same of the 1974 film! Which is like being stuck on a trans-Siberian carriage where the dining car has burnt down, leaving one tired, bored, dishevelled and far from sated. When Poirot proposes his solutions, everyone sits in the carriage like stunned mullets; either they’re bored to tears (like us) or discombobulated by Albert Finney’s squishily overripe performance as the great Detective. His accent is so bad as to be fascinating, combining the opaque enunciation of Peter Sellars as Inspector Clouseau with the outrageous preening of Pepé Le Pew. 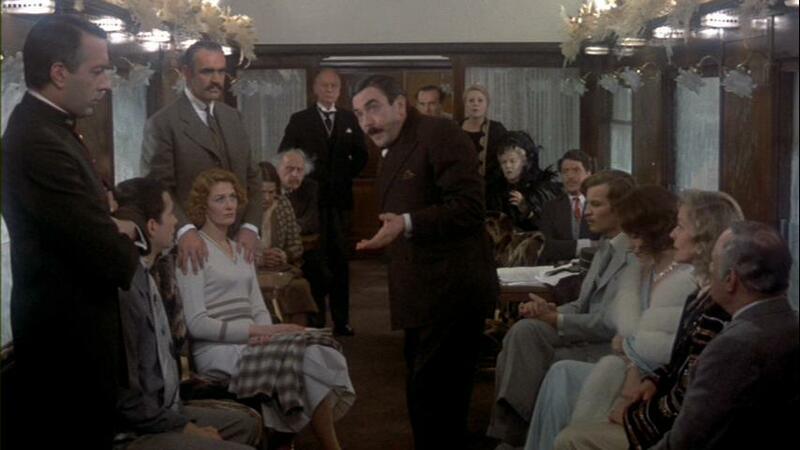 Consider the denouement in the dining car: Poirot / Finney whirls about like a Gallic Richard III, gazed at by – from left, Jean-Pierre Cassel as the conductor, Anthony Perkins, bobbing, gulping and twitching as the doomed man’s secretary, Sean Connery as a Pukka sahib, Vanessa Redgrave as his flirty squeeze, Ingrid Bergman as a frightened nanny, George Coulouris as the doc, John Gielgud as the butler, Colin Blakely as the (other) private detective on board, Rachel Roberts as Hildegarde, Wendy Hiller as the Princess, Denis Quilley as the chauffeur, Michael York as the Count, Jacqueline Bisset as the Countess, Lauren Bacall as Mrs Hubbard and Martin Balsam as the Director of the Simplon-Orient Express. We’ve linked some of these names to very good films in which they’ve appeared, to demonstrate the wastage on show in this one. This scene sums up Lumet’s film: as was his wont, he sacrificed story to character and let go of the actors’ reins far too much, such that they are loosed upon us, and the ceremony of enjoyment is drowned. Cue the Kenneth Branagh re-make. We’ll say one thing. It looks good, with (too many) gorgeous views of Istanbul and the snowy alps as the choo-choo chugs through the Balkans. It’s like Grand Budapest Hotel meets The Iceman Cometh. As Poirot, Kenneth isn’t too bad, evoking the character’s famous fastidiousness, love of order, his disapproval of murder. But leaving aside his mammoth, salt’n’pepper, tin-star mustache (surely the most risible facial appellation in film since The Mask), he is not really le type, being all-too much an action man, not enough the petit bourgeois, implying rather than demonstrating forensic skill. Johnny Depp is the victim and has nothing to do other than scowl and smoulder, which he does well enough, given that he seems to be getting ever more incoherent. Michelle Pfeiffer can’t erase the memory of Lauren Bacall as Mrs Hubbard. Judi Dench, Daisy Ridley, Josh Gad, Penelope Cruz, and Willem Dafoe are über-marionettes. Derek Jacobi has nothing to do. Leslie Odom Jr becomes a (non-Anglo) Indian Doctor Arbuthnot, rather than Colonel, a man, one suspects, unlikely to gaze at Poirot as if to say “only some damned foreigner,” a man similarly unlikely to wing the detective with a shot from his revolver, a script-graft unlikely to have aficionados scurrying back to the book for reference to that one. 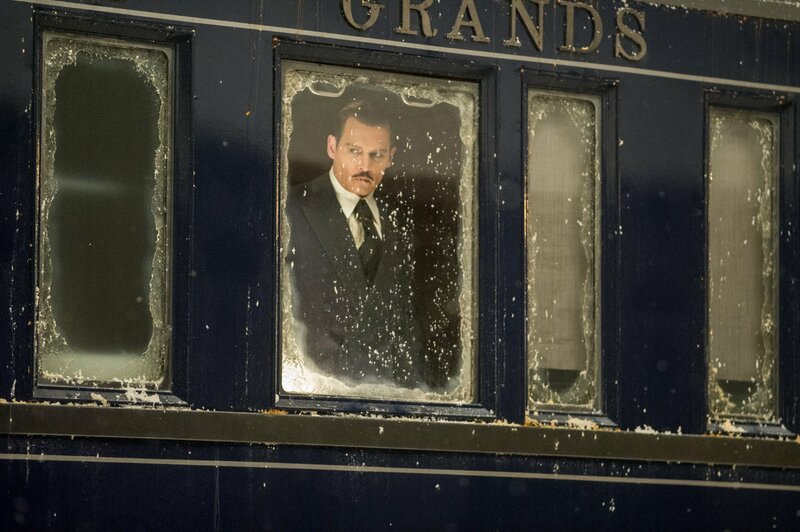 Nor would Poirot interview a potential murderer in a milk carriage exposed to the frosty elements. Nor would Hector MacQueen (Josh Gad) invite suspicion by stealing from his employer. Nor would one of the passengers stab Mrs Hubbard. Nor would the lass with the missionary zeal (Penelope Cruz) be called “Pilar Estravados” – isn’t she parachuted-in from Hercule Poirot’s Christmas? And while we’re quibbling, the Christie oeuvre is mined shamelessly – they steal lines from other books of the Dames’ – e.g., ‘I say like a little child “I do not know...”‘ (from Curtain). The bottom line, however, is that here the producers have removed the heart from Christie’s story and, with surgical precision, replaced it with a shiny, impressive, but entirely inferior, pacemaker. Great review Peter. Again your ability to draw on the book and previous film sources gives special meaning to your critique.